The 2017 Mitsubishi Mirage GT continues to be a smartly designed vehicle that delivers in style, fuel-efficiency, price and practicality. But there have been a few enhancements made that make it even more desirable to own and drive. There’s a new redesigned steering wheel, shift panel and air conditioning panel. Additionally, the front and rear seats get new materials, along with a redesigned hood, grille, front and rear bumper, fog and headlamps, rear spoiler and wheels. The exterior styling features an aerodynamic design that helps improve fuel-efficiency because it helps reduce the weight of the vehicle. 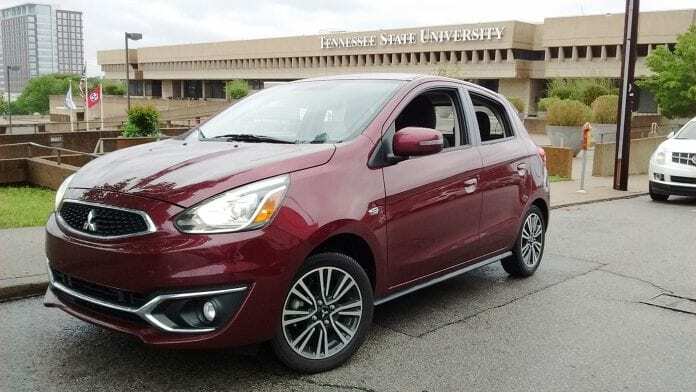 In addition to sporty styling and efficient aerodynamics, the Mirage exterior was designed to give you the best visibility around the car with minimal blind spots. On top of that, standard power side mirrors let you adjust your side view on the go while standard rear wipers keep the rearview crisp and clear. Let’s talk about safety. In addition to six standard airbags—including front, front-seat-mounted, and side-curtain airbags—Mirage adds a seventh underneath the driver’s side dashboard. It’s designed to stabilize your lower body and knees during certain types of frontal collisions, providing an extra level of protection when drivers need it most. The Active Stability Control (ASC) employs sensors that monitor the grip of each tire. If a wheel begins to slip, the system communicates with the ABS to apply the brakes to the wheels with the most traction, helping you to stay in control.